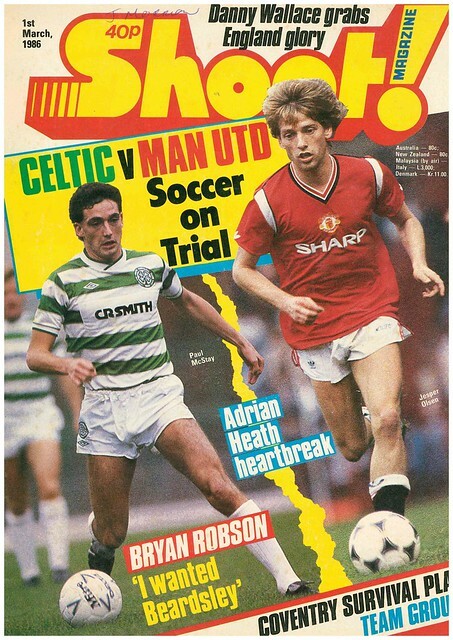 Celtic and Manchester United are on the cover of this week’s edition of Shoot as they prepare to face each other in a mid-season friendly, with the headline “Soccer on trial”. 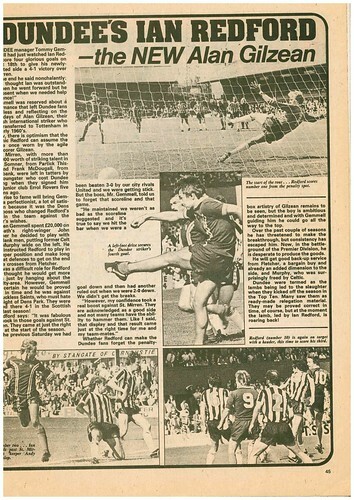 The headline refers to the fact that it was the first high profile away game by an English club since the previous season’s European Cup Final, which resulted in English clubs being banned from Europe. 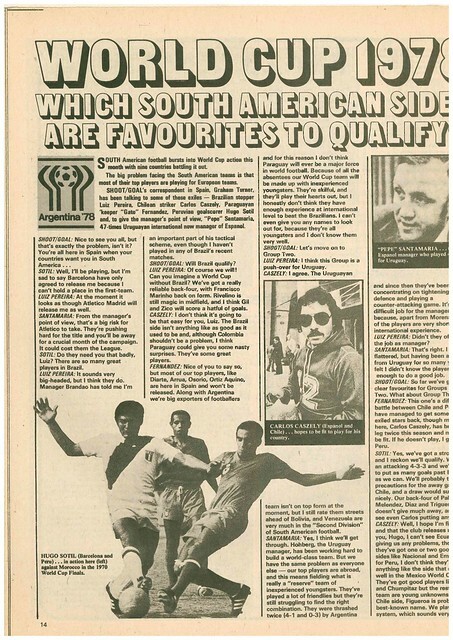 As you open the magazine, Danny Wallace fires a message to John Barnes and Chris Waddle that he is after their World Cup place following an impressive England debut in a recent friendly away to Egypt. 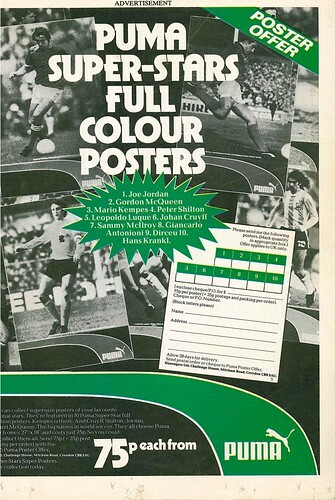 The friendly at Parkhead that featured on the cover gets a double page spread, with the game billed as an unofficial British Cup Winners Cup Final, after both teams won their respective national cup competitions in 1985. 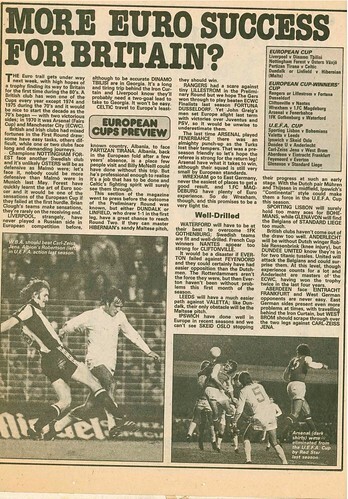 Paul McStay of Celtic suggests that a former Rangers player might have a keen interest in this game, as Scotland manager Alex Ferguson might take the opportunity to spy on Jesper Olsen of United, with Denmark being a group opponent of Scotland in the forthcoming World Cup. 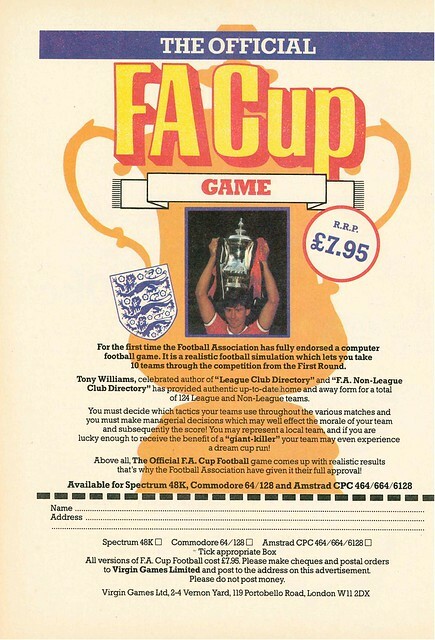 In ads, you can buy The Official FA Cup Game for just £7.75 on Spectrum, Commodore or Armstrad. Talking of adverts, England’s squad has agreed a sponsorship deal with the Health Education Council to front an anti-smoking campaign. 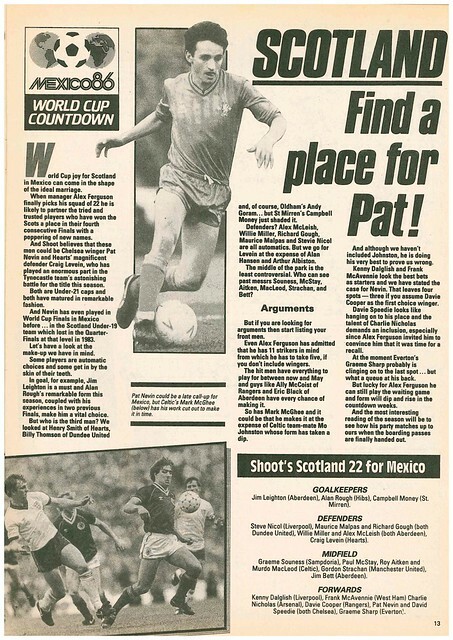 Bryan Robson uses his column to praise Peter Beardsley, who recently made his international debut during that recent friendly in Egypt. 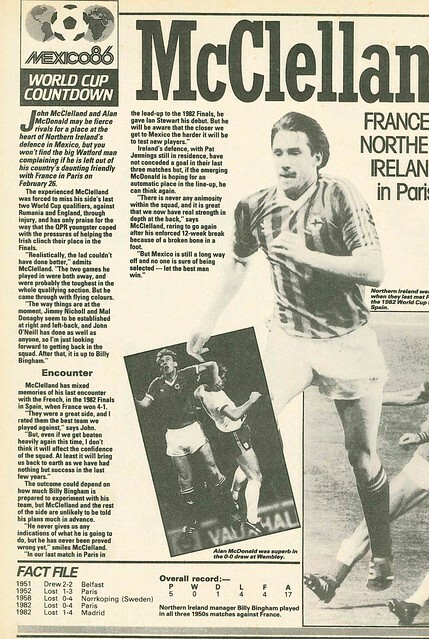 Northern Ireland are also in international action, with an away friendly against France, with the game getting a double page feature, with John McClelland being interviewed. 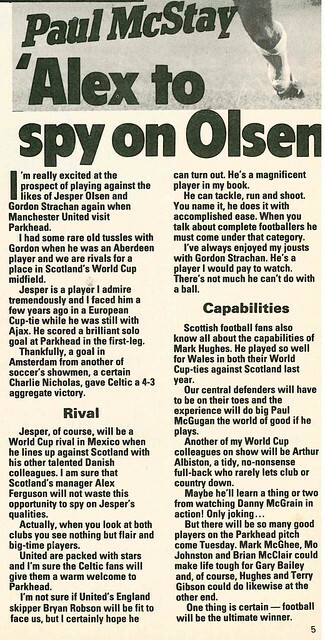 Shoot looks at the options for Scotland’s squad, and they urge Alex Ferguson to find a place for Pat Nevin in the 22. 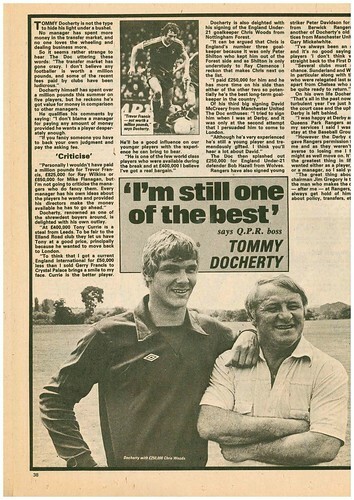 Staying in Scotland, Hibs youngster Gordon Hunter gets praised by his manager John Blackley. 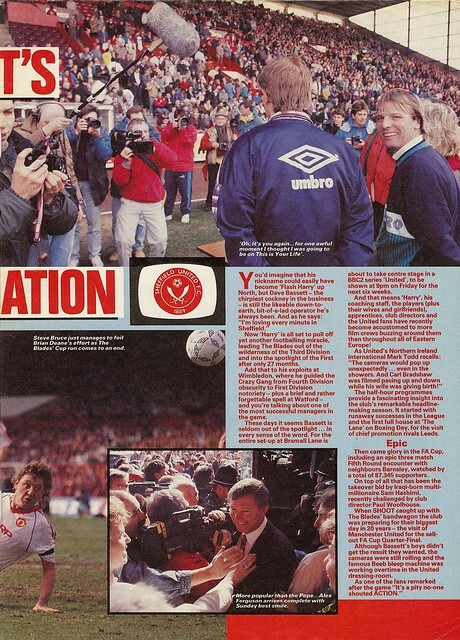 Phil Thompson is interviewed, where he states that if he could lead Sheffield United into the top flight, it would be as big a thrill as all the trophies he won with Liverpool. 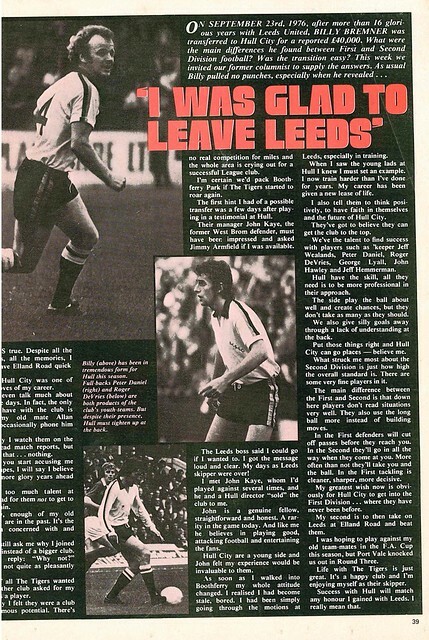 Across Sheffield, Wednesday striker Carl Shutt gets a full page profile. Jimmy Greaves awards his Wally Of The Week Award to Nick Gregory from Banbury, who states that Oxford United are the best team in England. 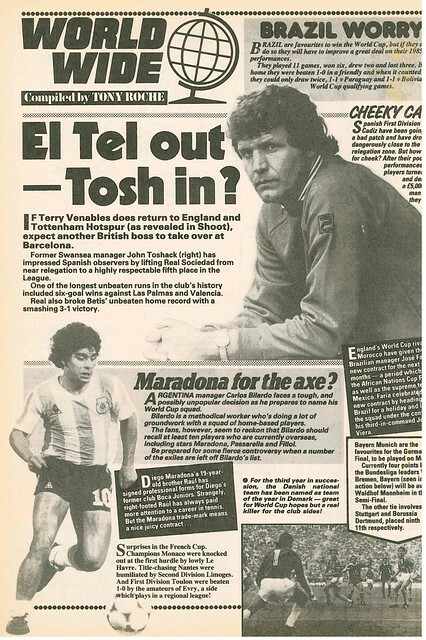 In Spain, Terry Venables is eyeing up a move to Tottenham Hotspur, but he could be replaced at Barcelona by another British manager, John Toshack of Real Sociedad. 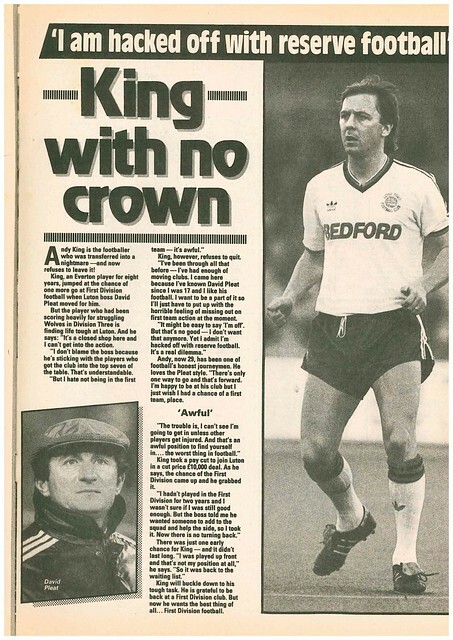 Andy King is interviewed where he expresses his frustration at not getting much action at Luton Town. 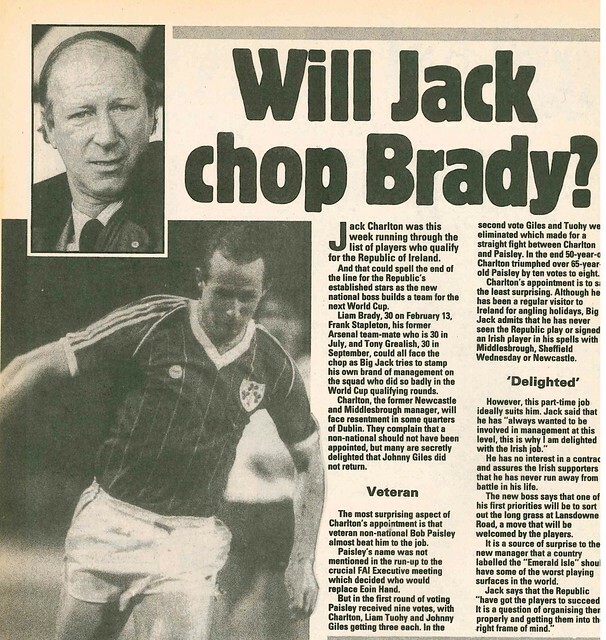 Jack Charlton, newly appointed Republic Of Ireland manager, has a big decision to make, as he might have to drop 30 year olds Liam Brady, Frank Stapleton and Tony Grealish. Charlton has faced some resentment for his appointment due to not being Irish, but also shock that he got the job ahead of Bob Paisley. Much loved referee Clive Thomas comments on the number of penalties missed in recent years, pointing the finger at his fellow referees for allowing keepers to steal yards. 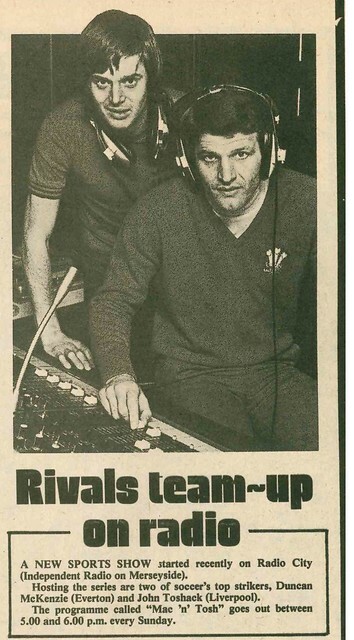 Craig Levein of Hearts gets a profile as he dreams of a World Cup place, just a few years after almost quitting football to work in an Electronics Factory. 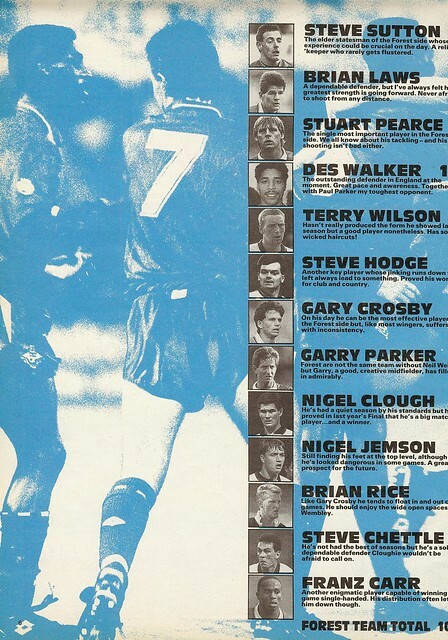 The upcoming Merseyside Derby gets a double page feature, with contributions from Peter Reid and Steve McMahon. 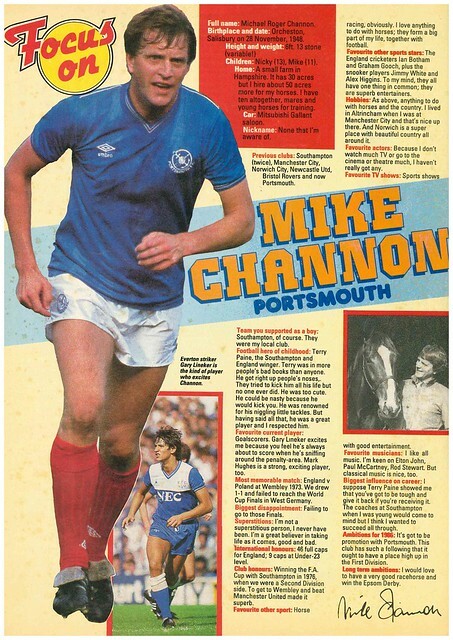 The magazine ends with a profile of Mike Channon. His favourite music is Paul McCartney, Elton John and Rod Stewart. 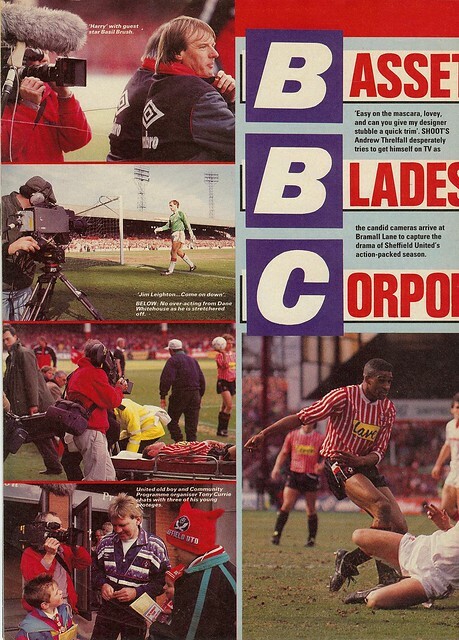 Today, we take a trip back to 1990, and Cup Semi-Final weekends in England and Scotland. 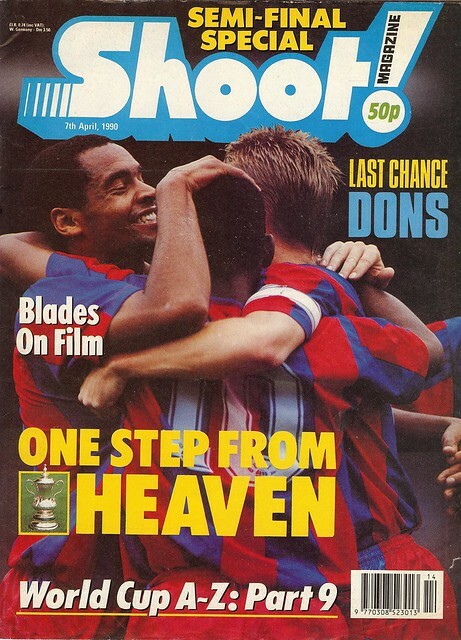 On the cover is Crystal Palace players in a celebratory huddle, with the headline “ONE STEP FROM HEAVEN”, a reference to the fact that they were 1 win away from their first ever FA Cup Final. 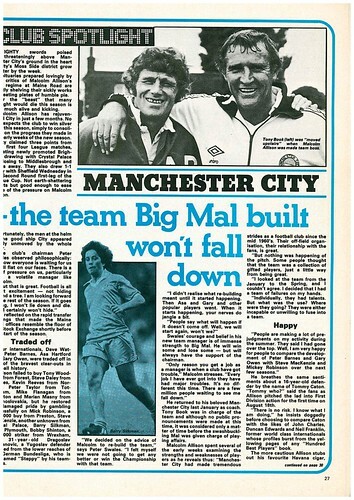 That match gets a double page spread across pages 2 and 3. 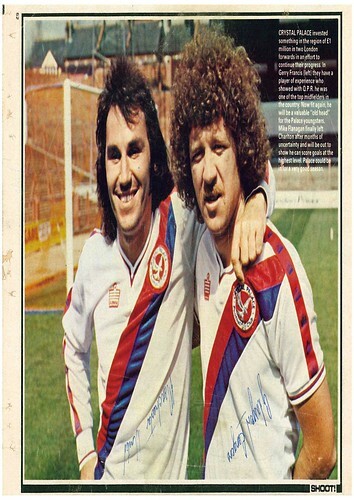 Steve Coppell, then manager of Crystal Palace, is billed as “Tipped as a future manager of Manchester United” and hus tipped by Palace striker Mark Bright to lead his side out in the 1990 FA Cup Final against the club he served as a player. As yet, Steve Coppell hasn’t managed Manchester United, but Mark Bright’s prediction that it would be a Palace v United final did come true. 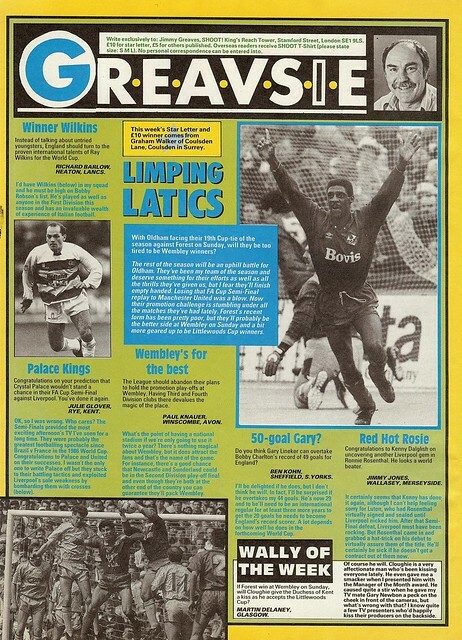 The other Semi-Final between Oldham Athletic and Manchester United also gets a double page spread. 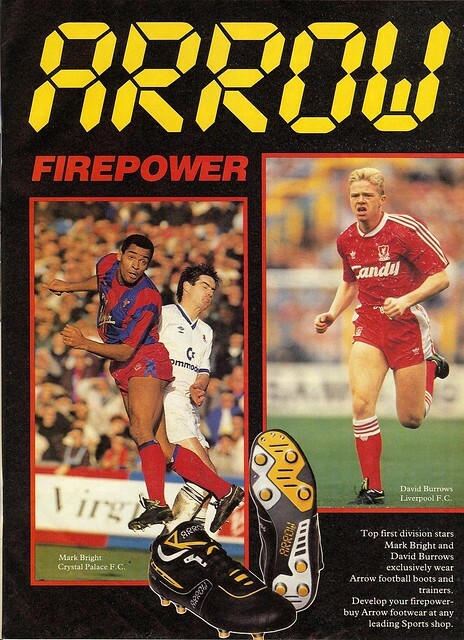 Mark Bright, who had predicted the two FA Cup finalists, also features in an ad for Arrow Boots alongside David Burrows. Jimmy Greaves letter page, as ever, is a joy. Stephanie Martindale of Islington asked about the possibility of Crystal Palace and Oldham Athletic upsetting their more illustrious FA Cup Semi-Final opponents, “No chance” said Greavsie. Crystal Palace beat Liverpool and Oldham Athletic led before taking Manchester United to a replay. Samuel Nelson from USA suggests that Terry Butcher should be punished by the FA with regards to his role in the England team after smashing a dressing room door after an old Firm game. Daniel Holbutt from Yorkshire suggests that if they get promoted, Leeds United and Sheffield United would be the two worst teams in the history of England’s top flight. 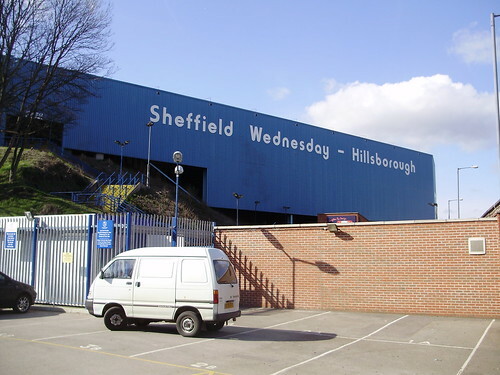 Sheffield United survived for 4 years before relegation, while Leeds United lasted 14 years, winning the title in 1992. John Say writes in to congratulate Danny Blanchflower on gettin a well deserved testimonial between Spurs and Norther Ireland. Details of the match can be found here. 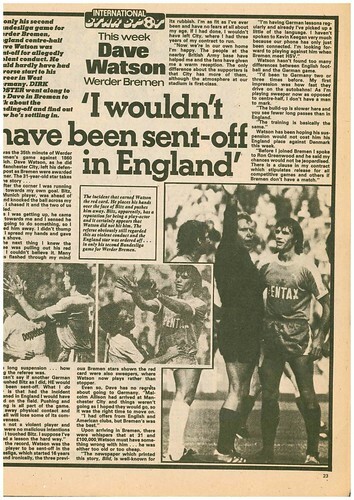 Mark Hateley gets the “Wally Of The Week” award for stating that he would be in England’s World Cup squad but for injury, and will be in the England squad for Euro 92. He didn’t. In world news, it emerged that Lev Yashin was working on arranging a UK tour for Dynamo Moscow in 1995 to commemorate the 50th anniversary of their tour in 1945. 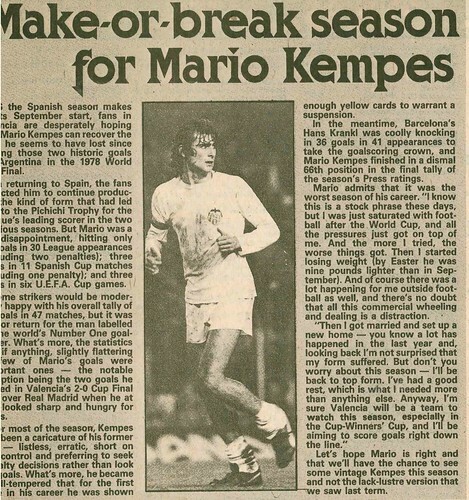 Ray Wilkins gets a double page spread as Shoot does a scouting report on him during a match for QPR against Nottingham Forest, amid a clamour for him to be part of England’s World Cup squad. Their verdict is that while Wilkins is a player in form, England should be looking to the future. 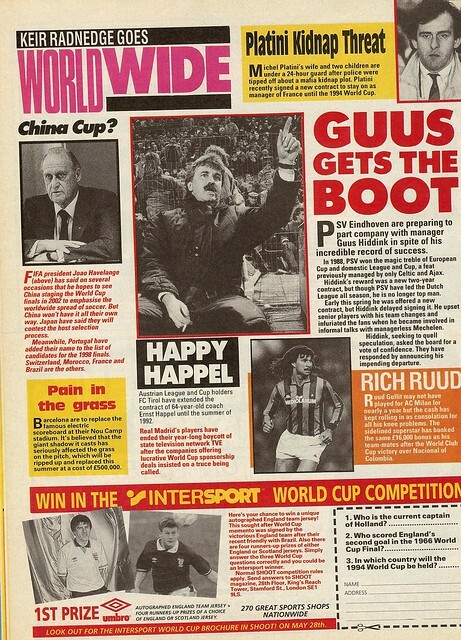 There is also an advert for the following week’s issue, which contains free World Cup stickers. The show was a fly on the wall look at events at the club. 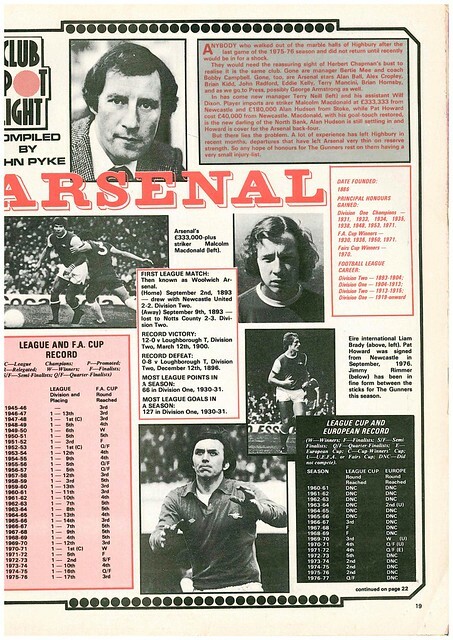 An eventful season saw them get promoted to what is now the Premier League, as reach the FA Cup Quarter-Finals. 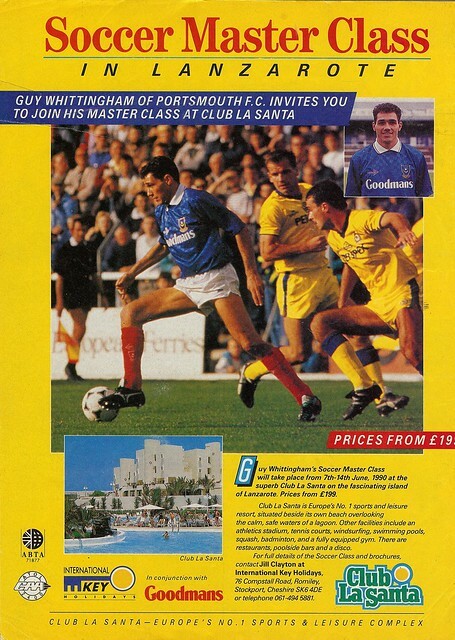 There is an advert for Guy Whittingham Soccer Masterclass, a football camp in Lanzarote. 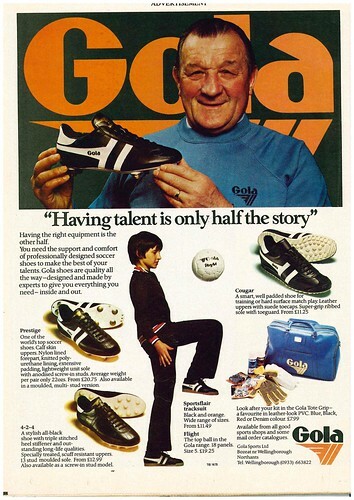 For just £199, you could be as good as a squad player for Sheffield Wednesday and Aston Villa. 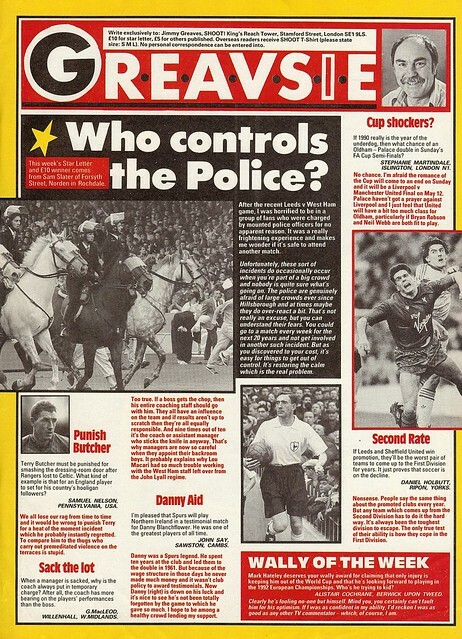 This edition of the Magazine Archive sees us look at Shoot from 28th April 1990. 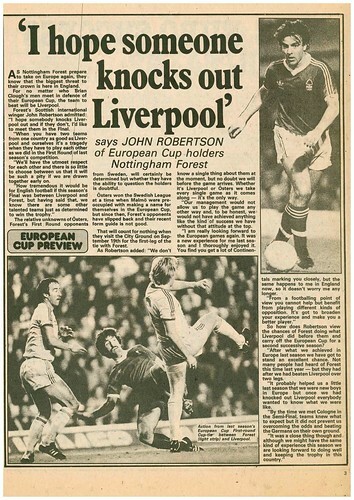 This week, was focusing on the Rumbelows Cup (That’s Carling Cup in modern currency) Final between Nottingham Forest and Oldham. 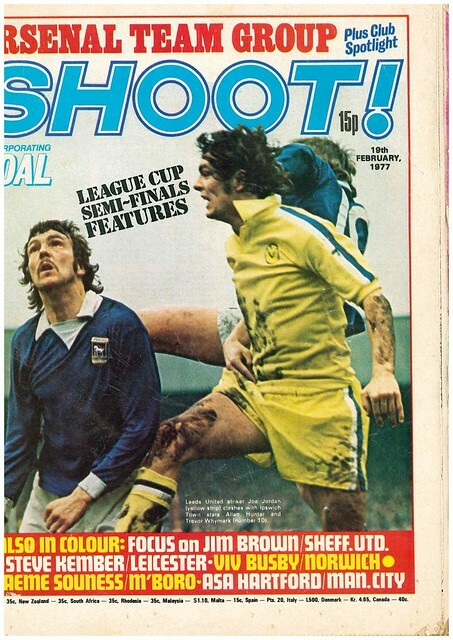 With the two clubs not meeting in the league that season, the cover image is of an Oldham player in a challenge with Manchester United’s Bryan Robson during the recent FA Cup Semi-Final between the two sides. Personally, I would have went with a split image of a player from each team. 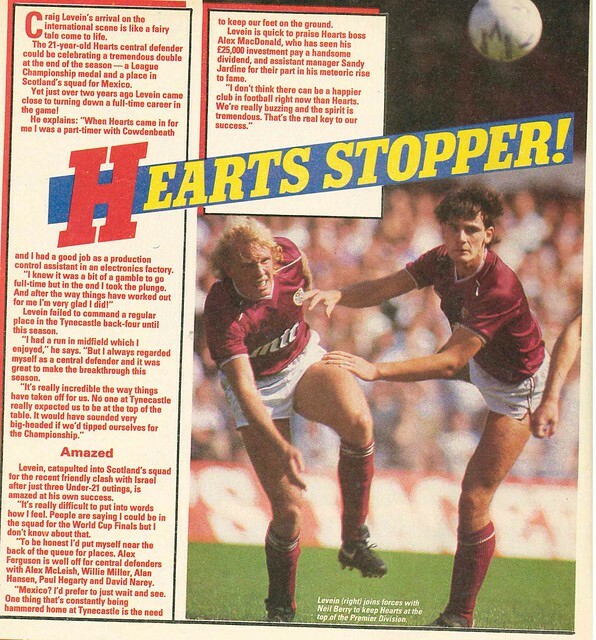 A further double page spread is given to “Shoot Star Writer” Tony Cottee’s pre-match preview. 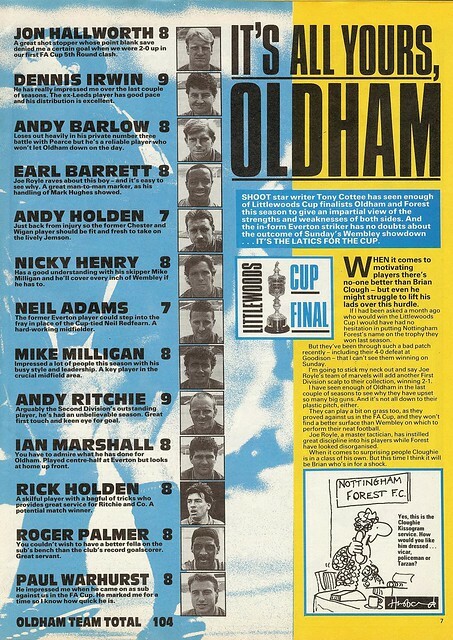 He rates each player in the starting 11 and 2 subs out of 10, with Nottingham Forest scoring 103 and Oldham scoring 104 with Cottee declaring that Oldham would win. Nottingham Forest won the final 1-0 with a goal from Nigel Jemson, who 14 years later would be playing for Ballymena United. Meanwhile, there is a competition to win flights and tickets to see England’s World Cup games against Republic Of Ireland or Holland. 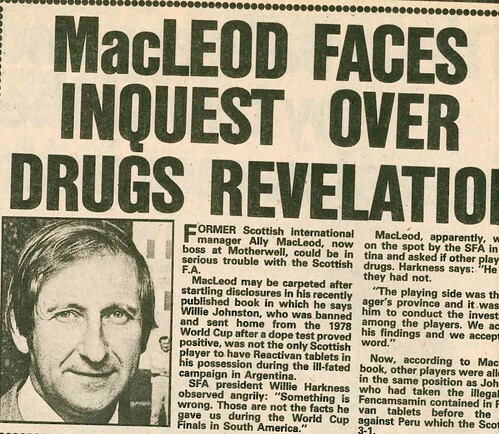 Keir Radnedge’s column (He was the editor of World Soccer, owned by IPC who also owned Shoot)focusing on the rest of the world, sees FIFA President Joao Havelange stating that he wants to see China host the 2002 World Cup finals, while Japan have stated they wish to bid to host this event. Japan did eventually host the 2002 World Cup, but in a co-hosting arrangement with South Korea. That week, it was also announced that Portugal are wishing to bid to host the 1998 World Cup, in a candidate list which also includes Switzerland, Morocco, France and Brazil. France were awarded hosting rights to the competition, which they won, beating Brazil 3-0 in the final. Portugal (Euro 2004) and Switzerland (co-hosting of Euro 2008) have since gone on to host further tournaments, while Brazil (2014 World Cup) and Morocco (2015 African Nations Cup) are scheduled to host tournaments withing the next five years. Morocco would also have a failed bid to host the 2010 World Cup, losing out to South Africa. 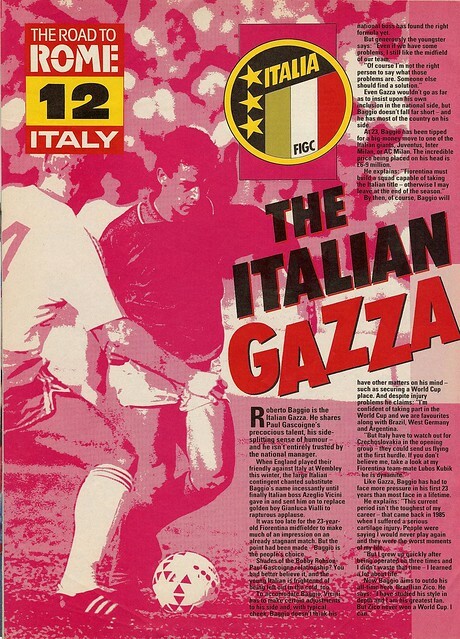 The build-up to that summer’s World Cup continues with team previews of Italy, Romania, Holland, England and Scotland. There is also a double page spread of Stuart Pearce proving how hard he is by driving a tank. 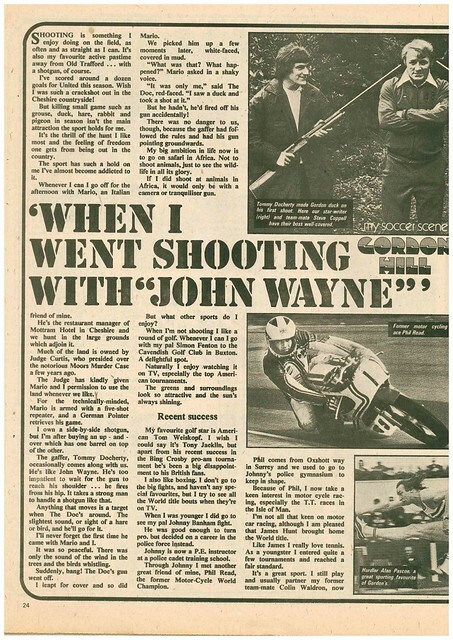 He admitted that he almost joined the army after leaving school, and blames not getting in on telling them that he had an application pending with his local police force. In rumours, Chris Woods is going to sign for QPR and Pat Nevin is going to sign for Celtic. Neither transfer happened. 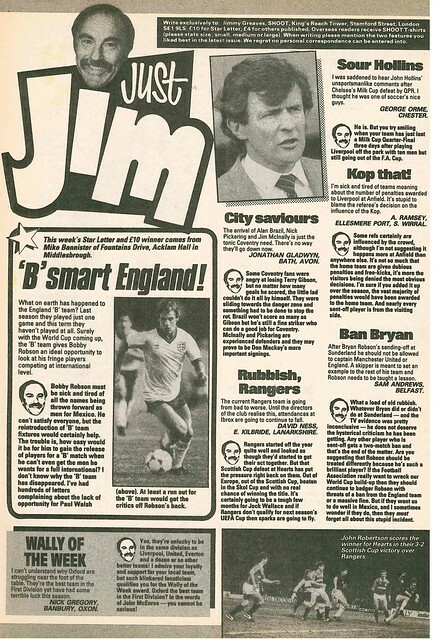 Jimmy Greaves letters page is an eye-opener as Richard Barlow from Heaton suggests that England should bring Ray Wilkins to the World Cup in Italy. Julie Glover from Kent dishes it out to Greavsie over his prediction that Crystal Palace wouldn’t stand a chance against Liverpool in the FA Cup Semi-Final at Villa Park. Paul Knauer from Avon writes in to complain about the Third and Fourth Division (That’s League One and League Two in modern currency) Play-Off Finals at Wembley as it devalues the prestige of the venue. 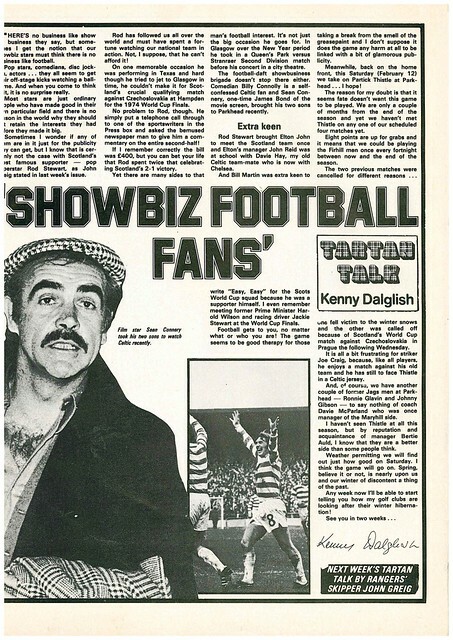 Jimmy Jones from Wallasey in Merseyside writes in to congratulate Kenny Dalglish on unearthing a world beater in Ronny Rosenthal. Oh hindsight, what a wonderful thing. 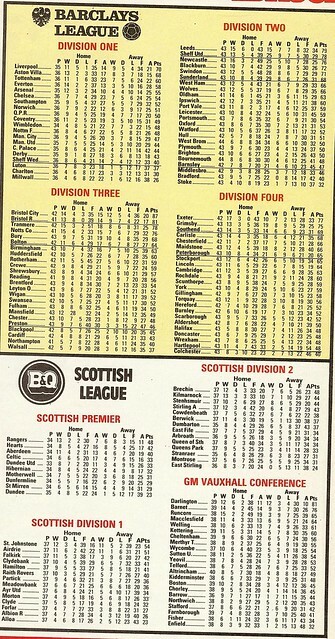 In Scotland, Rangers are facing competition from Hearts and Aberdeen for the title, with Celtic 15 points behind in 4th. 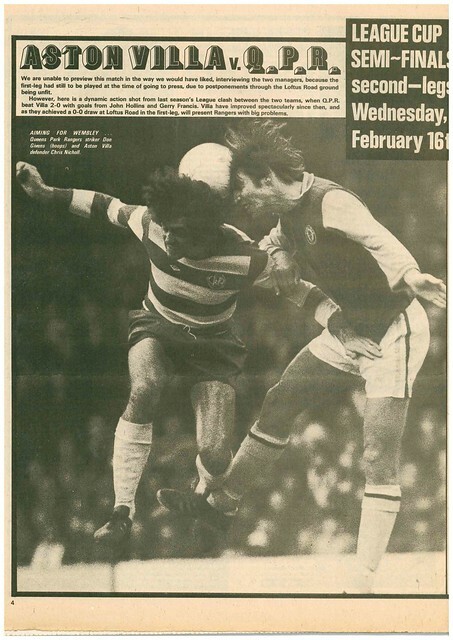 The ad for the following week’s edition has the headline “STEWART HITS OUT”, referring to Tottenham Hotspur’s Paul Stewart. 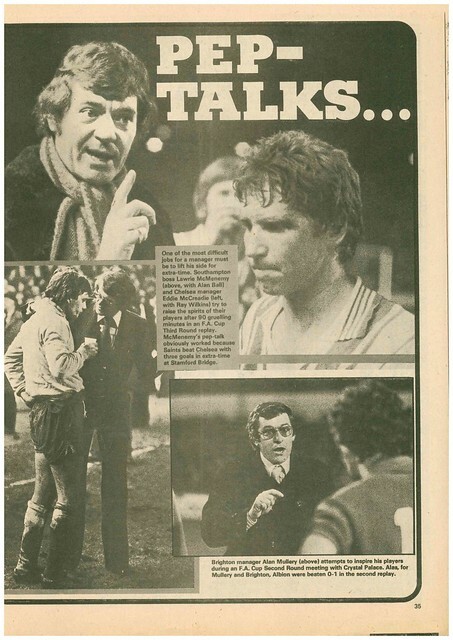 Meanwhile, a double page spread is dedicated to an explosive interview with Charlie Nicholas, then of Aberdeen, declaring that he is leaving Pittodrie and that he is “Finished” with Scottish football. 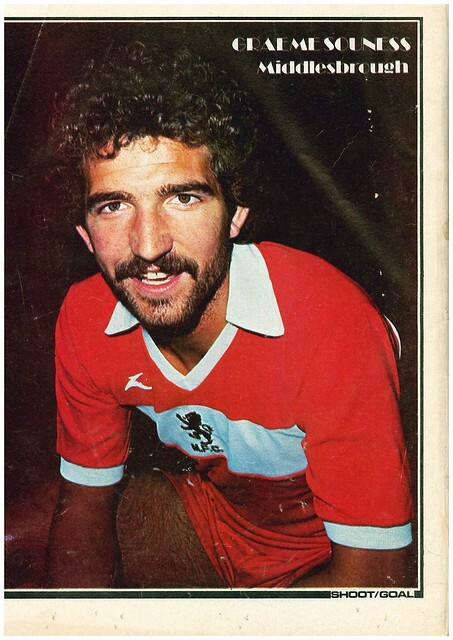 He signed for the very much Scottish Celtic that summer. Think of it as Corinthan figurines, but a bit bigger. 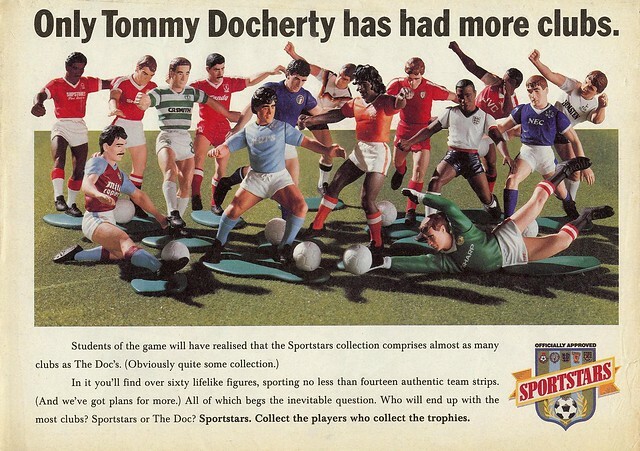 I had Bryan Robson, Neville Southall, Diego Maradona, Marco Van Basten, Peter Beardsley, Thomas Von Heeson, Mo Johnston, Ruud Gullit and Paul McStay. In the middle of the dark January when the news was dominated by travel disruption caused by freak weather, unlike now, I just felt like I needed something to look forward to when the weather improved come April. 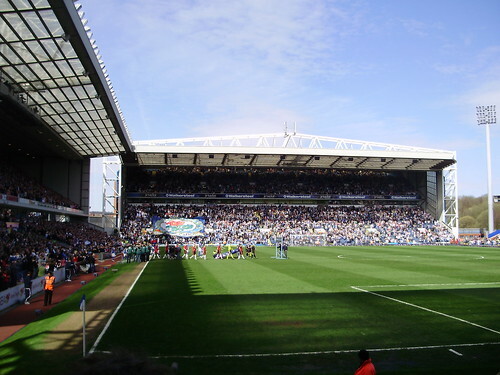 Having taken a shine to the possibility of going to Ewood Park to watch United take on Blacburn, and seeing James on tour, I decided to book a mini tour of the North of England, and then count down the days. The build-up was nervous as a threatened rail strike meant I faced the very serious possibility that I would be spending 3 hours on a bus with an hour long stop in Leeds. Thankfully, that situation was avoided. 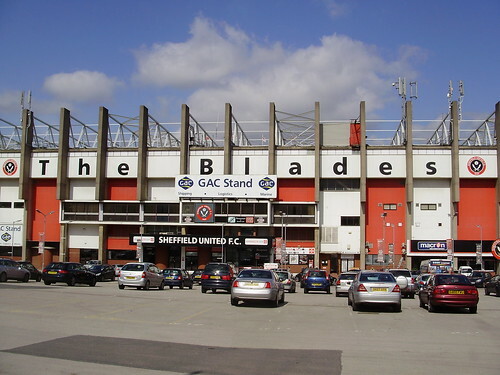 After checking in to my hotel, I decided to have a wee stroll in Sheffield City Centre and the first thing I saw was the top of the main stand at Bramall Lane, home of Sheffield United. 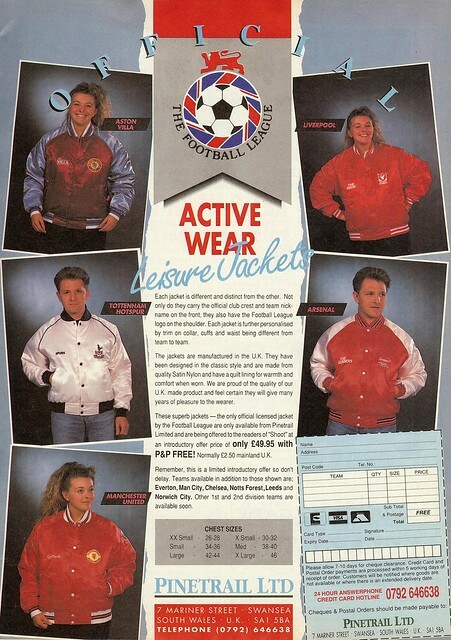 I decided to have a wee nosey at the ground and started by visiting the club shop. Unfortunately, I wasn’t able to get access to the stadium to look inside, but I did get some photos of the exterior. Later on in the afternoon, I saw a bus with ‘Hillsbrough’ on the LED screen at the front, so I decided to jump on, in the interests of fairness. I had a wee look in the Wednesday shop, and the first thing that comes to mind is that it is spacous. 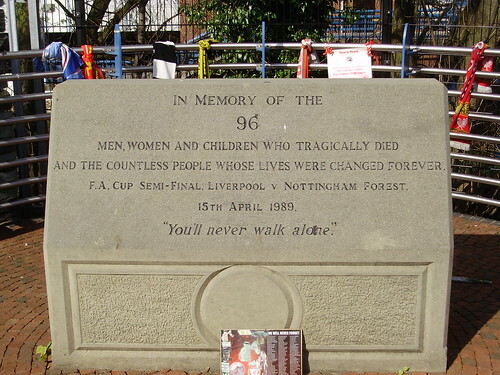 Like at Bramall Lane, I wasn’t able to actually get inside the stadium, but I did get a look at the memorial stone for those who died in the Hillsbrough Disaster, the 21st anniversary of which was this week. Back in the city centre I had an enjoyable day. Sheffield is worth visiting, though it is probably more to my detriment that I didn’t get to see a lot of the city as I had to cram it all into one day, though it certainly doesn’t have the wow factor that Manchester has. Thursday night was spent at the O2 Academy in Sheffield to see James in concert. If you’re too lazy to click the link, James were excellent. Come Friday, it was bye bye Sheffield and hello again Manchester. Having been there in February, I spent most of my time based in the city centre (though in reality, with the football matches on Saturday and Sunday and going home on Monday afternoon, I only got one full day in the city centre) I decided that I wanted to see more. Having booked tickets to see Sean Lock on the Sunday night at the Lowry Theatre, I decided to do a dry run to try and find the venue and get home from it. 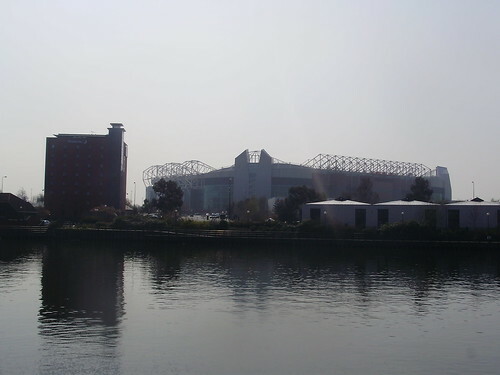 Getting there was easy enough, and Salford Quays on a beautiful sunny day is an enjoyable experience, especially when you can get a brilliant view of Old Trafford. If only I had a better camera with a better zoom. The Lowry Centre is well worth a visit, whatever your interest. 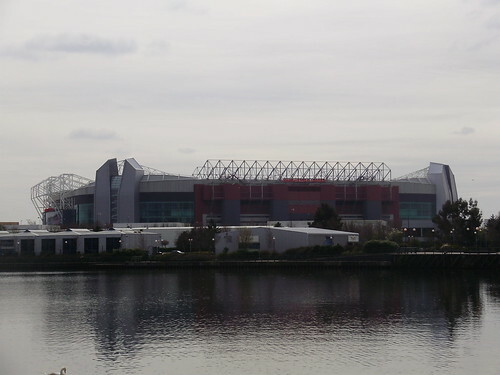 I decided to then walk up to Old Trafford, just to see what it was like on a non-matchday. Despite there not being a match on, there was plenty of activity, as local merchandise stall holders were on hand to satisfy the needs of passers-by. As I was walking past, preparations were being made for the weekend’s big event, not a United match, but the X-Factor auditions. From there, I popped in to the ‘other’ Old Trafford, to have a wee look around and was rather embarrased to walk in during a match between Lancashire and Durham. I didn’t really have a clue what was going on. After taking an early night on the Friday to try and compensate for the 3am start on Thursday. I was up bright and early on Saturday morning to get a train to Liverpool. Word of advice, NEVER EVER get a train to Liverpool on the morning of the Grand National as it’s a warzone, although it was funny to laugh at the drunk knobs on their way to the event, who clearly didn’t have a clue about Horse Racing. The reason why I was in Liverpool was that I was visiting a mate who had moved there from Belfast. I was meeting him at 4.30pm to watch the Aston Villa-Chelsea match and get something to eat. I decided to head over early and see a bit of the city before meeting up. 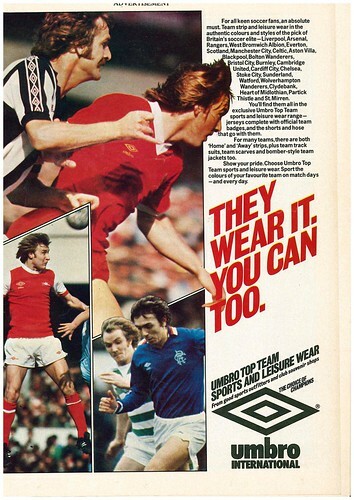 The first thing I did was visit Central Library, across the road from Lime Street Station to view ‘The Everton Collection‘, which was suggested (actually, it wasn’t suggested, I was told to go) to me by a work colleague. As the name suggests, it is a collection of Everton memrobillia, and it was great to look around he collection, and see the history of one of Britain’s biggest football clubs right before you. Unfortunately, the exhibition will be closing this weekend. After viewing it, I couldn’t help but think how good ‘The Linfield Collection’ would be, if it was feasible, especially with the club’s 125th anniversary taking place in 2011. It would be great to have a room to view articles and memrobillia from Linfield’s history, either in Central Library or City Hall, though even if it was downsized, it could work to the club’s advantage, possibly taking place in Sandy Row Library, which could help the club reach out in it’s local constituency of South Belfast. On Saturday, Liverpool City Centre was transformed into a mini-spain for the day, and it wasn’t just the weather, as the Spanish Holiday Board tried to cash in on the success of Merseyside football legends such as Antonio Nunez and Albert Rieira by attracting loads of Scouser to their country through a fair in the city centre, complete with live music. Last Saturday was the hottest day of the year so far, and I was gagging for a lolly, more precisely, a Polly Pineapple, which there didn’t seem to be any in Liverpool. 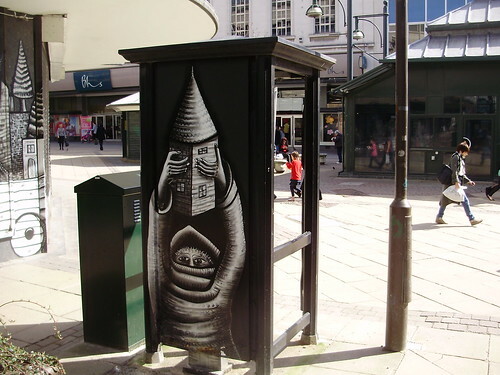 If you love graffiti, Liverpool is worth going to, as there was some excellent pieces. 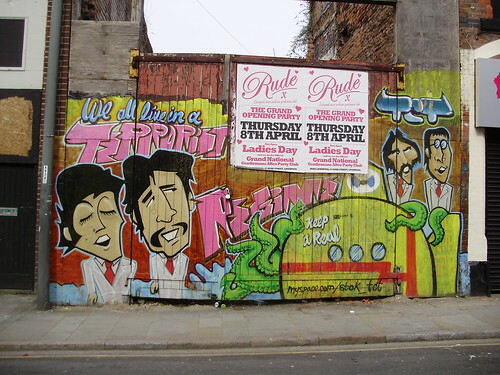 One of my favourites was an animated portrait of The Beatles with the tagline “We all live in a terrorist regime”. 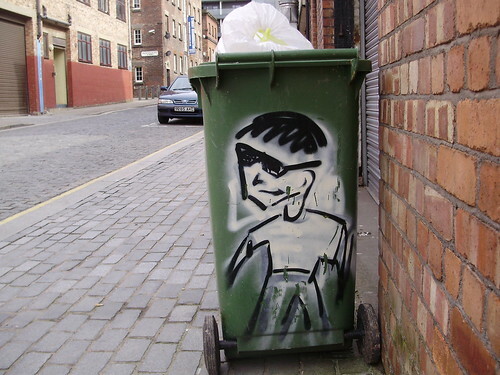 The Myspace link at the bottom of the image is that of a Liverpool based graffiti artist and well worth checking out. 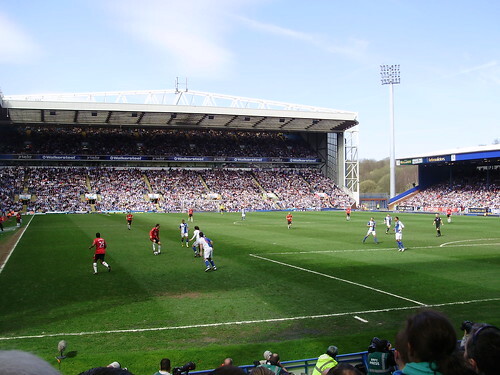 After meeting up and having dinner while watching Villa lose to Chelsea, I headed back to Manchester on the last train, as we were to meet up in Blackburn, ahead of travelling to Ewood Park to watch United take on Blackburn. It was my mate’s first United away match, and my first away match in the United end. 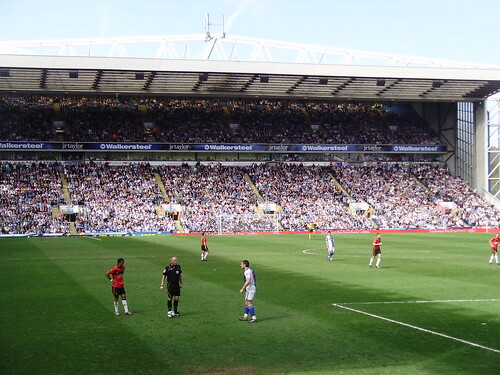 The only other United away match I was at was incidentally at Ewood Park, as I sat with Rovers fans as I had to keep quiet three times when United scored, though unfortunately, Blackburn scored four which ruined the night. After meeting up at the train station we shared a taxi with four others on the way top the ground, at a total charge of £6, £1 each. Win. 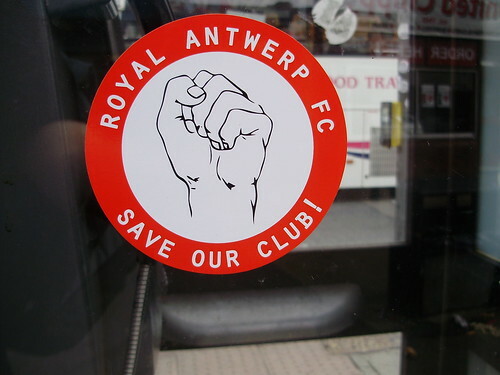 We headed into the deignated away supporters bar, The Fernhurst, which was heaving so much, we only (just about) were able to get 1 drink for the time we were there. The match itself, was a frustrating affair. It was one of those games where you reach a point midway through the first half where you realise no matter how much possession and chances you have, it’s going to end 0-0. If it was an uphill struggle after the Chelsea defeat, United now have a mountain to climb after this result. I then headed back (eventually, after being stuck in a hick town reminiscant of Royston Vasey) to Manchester to see Sean Lock, who I managed to miss the first five minutes of due to disruption on the tram line. Thankfully, the rest of the show made up for this inconvenience as he was excellent. I also did a bit of celeb spotting as his 8 Out Of 10 Cats co-star Jason Manfiord was sat directly 2 rows in front of me. I didn’t se Jimmy Carr though. On my way to The Lowry, I noticed some anti-Glazer graffiti on the walls along Salford Quays, which I went to get some photos of on Monday morning, before mostly milling around Manchester before getting a bus to Ringo Starr Airport for my 7.30pm flight. Flying at Sunset is truly amazing, I really wish I was able to get some photos whilst on the plane. Well, that looks like me in terms of travel for the near future, until I starting getting the wheels of a trip to the Edinburgh Festival in motion once the Finge programme gets published on June 10th. Already counting down the days.